Alexandra Gould is a portrait painter based in Wiltshire. Working mainly in acrylics, she aims to show the character of her sitters by manipulating texture and lighting while also introducing patterned and textured elements. We caught up with Alexandra to talk about her artistic practice and to congratulate her on her recent inclusion in the Ruth Borchard Prize Exhibition at Piano Nobile Kings Place. Image: Alexandra Gould at work in her studio. Duncan Montgomery: Hi Alexandra, thanks for talking to us. Firstly how long does the process of painting a portrait take for you, and what’s involved? You mention on your website that you prefer to paint at larger-than-life size. Is this because your portraits are generally head-and-shoulders rather than kit-kat style? Alexandra Gould: A portrait can look great after 2 hours of working from life – it can capture the dynamic but need subsequent sittings and work from photos that could commit another 60 hours of painting. At other times a 3 hour sitting can leave the strongest feeling of how to proceed but very little on the canvas and just a few photos. This portrait might be much harder to evolve making sure the personality continues to be expressed alongside the detail of the photo. I do want to create paintings of people, not just their likeness. A portrait solely from life is faster – maybe 50 hours but will span months as sitting for a painting isn’t an easy or convenient part of our busy lives. Meeting the sitter resolves the final composition. It is relaxed but on my part quite a focused experience. I am looking at them and their mannerisms in an analytical way, establishing what would suit the person and purpose. I am also working out how they feel about being looked at and if they struggle to maintain eye contact I’d paint them without a direct gaze from the painting to the viewer, otherwise the discomfort shows through. I’m mentally composing so it feels right. I try to fill the canvas with all the personality of the moment, I find the people I paint so engaging that I want to say as much about them and my experience as possible. For me that is a larger than life experience, more detailed than the space I have on a surface – there is more than just their likeness to paint so I focus on their personality, on their face. If a sitter was particularly expressive with their hands I’m sure the kit-kat style might be more fitting. Alexandra Gould, ‘Portrait in Blue Scarf’ (Acrylic on Linen, 50 x 70cm, 2017). DM: Congratulations for being invited to show your work in the 2017 Ruth Borchard Self Portrait Exhibition. How is the process of painting a self-portrait different from your normal portrait painting practice? AG: Painting for the Ruth Borchard Prize was an experience unique to self portraiture. I had to work from life as it offers so much more than a photo and the process of painting from life day in and day out was much more intense and engaging. As I painted my portrait in early winter, it was also subject to changes in the light and a constant flux of decision making about colour and tone which doesn’t exist when the light qualities are recorded in a photo. However, photos do make the portrait process so much easier for the sitter and artist. I can dedicate continuous time to realizing the portrait without being concerned for their comfort but if I could work daily from life on a portrait until it is complete I would! Alexandra Gould, ‘Self Portrait with Glasses’ (Acrylic on Linen, 50 x 70cm, 2016). DM: Your Borchard prize submission is very intriguingly lit; there’s a warm glow from below which you’ve rendered with an almost pointillist effect on the shoulders of your wooly jumper. It’s a very theatrical effect. Do you think there’s something inherently theatrical about self-portraiture that sets it apart from most other portraiture? AG: I did really enjoy using that light – it was a tool to add colour and definition that is easier to achieve on a self portrait because the aim was to experiment and make a visually intriguing image. I want to look at the painting and see colour and shape, to be more accurate in how my eyes and hand are interpreting what’s before me. In that way my portrait is theatrical because it is a visual experience that should be striking and enjoyable but the thoroughness and attention to detail is very much a part of who I am. Self portraiture is so varied, artists often depict themselves because they can always model when they can paint and it is easier to scrutinize your own face than others. When I reflect on other portraits a few are theatrical, some strike me as very matter of fact and others as very vulnerable or even removed – I believe they are as varied as the people they portray. Image: Alexandra Gould, ‘His Ideas’ (Acrylic on cradled board, 22.9 x 30.5cm, 2016). DM: How did you come across Jackson’s Art Sites, and what do you use your own website for? AG: I use Jackson’s Art for everything from linen and gel mediums to gloss varnish. Fortunately when a materials order was delivered, a promotional flyer for Jackson’s Art Sites was packaged with my receipt. I kept it knowing that when the time was right a £40 website was a great offer. The art site facilitated buying a domain name and email, separate but linked to my personal email account. I could trial the website by designing and trying out the user interface and then I could select the subscription duration. Now it’s up and running I use the user guides, manage the appearance of the site and check statistics on usage each week. DM: I notice that you’ve gone for a very simple theme with your website. It’s almost like the online version of a ‘white cube’ gallery. I’d be interested to hear about the process of designing your site and getting it online. AG: With a background in business and film I have learnt that it is vital to keep messages clear and easy to access. The first priority was a domain with my name and a website that was designed for a mobile device. I also wanted one image to be presented at a time. Since a painting can’t be truly reproduced I knew that I needed each painting to be given the best chance it had of looking like the original. The size is dependent on the viewer’s screen but at least on a white background the viewer isn’t subject to colour combinations I didn’t intend. I selected the thumbnail options in each gallery because I prefer to see a static screen of choices than wait for a slideshow. My website is just a combination of my preferences for easy online viewing. I intended to keep the site very minimal but the viewer sometimes wants more information such as exhibitions, details of commissioning and by omitting those there might be a lack of engagement and possibility a loss of opportunities. Going forward I now have to balance this sort of content with viewer experience. 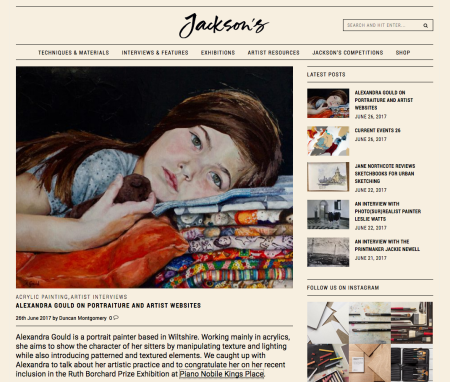 Jackson’s Art Sites are very well supported and making text formatting choices or page layout changes and image uploading is all so easy. I now regularly use the web management tools and it’s great to pick up where I left off without re-familiarizing myself with overly technical terms. I found that if I got stuck I tried things out before contacting online support and often that playing helped my understanding. In the future I might sell work online and I have no doubts that it’ll be straightforward and if I need help I can contact support. That is a huge advantage to Jackson’s Art Sites and over time, online analytics will also help search engines find my site and the information I choose to post on it. As for the grand moment of making the website live – it is so straight forward that the click of a button was almost an anticlimax but the joy of finding my site on every device in the house was very satisfying! The 2017 Ruth Borchard Prize Exhibition runs at Piano Nobile Kings Place from 18 May to 22 September. Interested readers can see more of Alexandra’s work on her website. The image at the top of this post is Alexandra Gould, ‘Foundations’ (Acrylic on Canvas, 54 x 75cm, 2016).